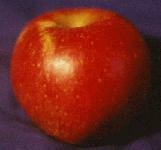 Developed from Winesap to obtain larger size, better flavor, and better keeping qualities. Crisp and tangy. Good for fresh eating and cooking. Ripens in late October in the Willamette Valley.